Stunning performance in front of a huge audience at the open air Odeon of Herodes Atticus, as Charles Lloyd, uniquely-expressive saxophonist, and Maria Farantouri, Greece's voice of resistance, come together. Friends for some years, this is their first recorded collaboration. Lloyd's brilliant quartet is on hand - with Jason Moran in especially creative mode - augmented by lyra player Socratis Sinopoulos and second pianist Takis Frazio in a marvelous programme that includes songs by Mikis Theoedorakis, suites of Greek traditional music, Eleni Karaindrou's "Journey to Kythera" and Lloyd originals including his classic "Dream Weaver". 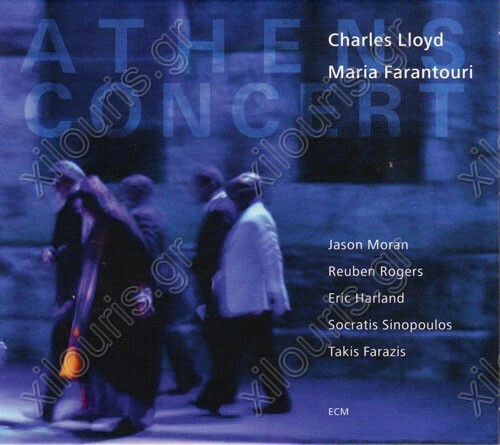 "Athens Concert" is a major event, a very special live album indeed.